There is no better networking value in the CPG and Food Industry! Are you a professional in the Consumer Products, Beverage Alcohol, Drug or Food industry? Do you work for or own a company involved in getting products and services to the Grocery, Drug, Mass or Alternate Channels, including online and specialty retailers? 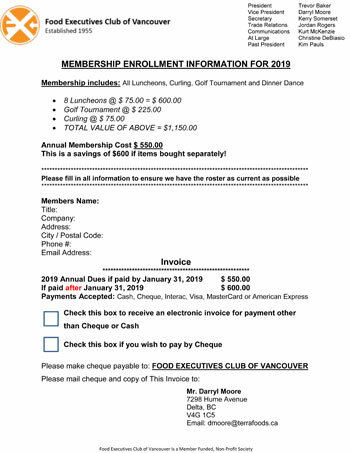 Whether you are a manufacturer, broker, distributor or other service provider, the Food Executives Club of Vancouver is a terrific way to network and stay informed with the latest state of business with the leading retailers in Western Canada. TOTAL VALUE OF ABOVE if attended a la carte = $1,150! The Early Bird Membership cost is just $550 and this includes every luncheon and event of the year! The price goes up $50 as of January 31st, so don’t miss your opportunity and join today! To become a part of this vibrant community of professionals, simply fill out attached form and email it to info@fecov.com. If you have any questions about the membership, please contact Kurt McKenzie at info@fecov.com.